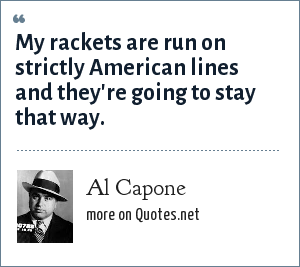 Al Capone: My rackets are run on strictly American lines and they're going to stay that way. "Al Capone Quotes." Quotes.net. STANDS4 LLC, 2019. Web. 23 Apr. 2019. <https://www.quotes.net/quote/11589>.